For other uses, see Mason Dixon. 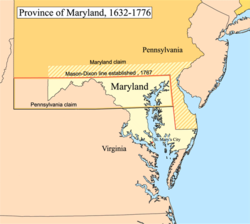 The Mason–Dixon line, also called the Mason and Dixon line or Mason's and Dixon's line, was surveyed between 1763 and 1767 by Charles Mason and Jeremiah Dixon in the resolution of a border dispute involving Maryland, Pennsylvania, and Delaware in Colonial America. It is still a demarcation line among four U.S. states, forming part of the borders of Pennsylvania, Maryland, Delaware, and West Virginia (originally part of Virginia before 1863). Later it became known as the border between the Northern United States and the Southern United States. Before the Missouri Compromise, the line (west of Delaware) marked the northern limit of slavery in the United States. It is still used today in that figurative sense, as a line that separates the North and South politically and socially. The conflict became more of an issue when settlement extended into the interior of the colonies. In 1732 the Proprietary Governor of Maryland, Charles Calvert, 5th Baron Baltimore, signed a provisional agreement with William Penn's sons, which drew a line somewhere in between and renounced the Calvert claim to Delaware. But later, Lord Baltimore claimed that the document he had signed did not contain the terms he had agreed to, and refused to put the agreement into effect. Beginning in the mid-1730s, violence erupted between settlers claiming various loyalties to Maryland and Pennsylvania. The border conflict would be known as Cresap's War. After Pennsylvania abolished slavery in 1781, the western part of this line and the Ohio River became a border between slave and free states, with Delaware  retaining slavery until the Thirteenth Amendment was ratified in 1865. Diagram of the survey lines creating the Mason–Dixon line and " The Wedge"
Mason's and Dixon's actual survey line began to the south of Philadelphia, Pennsylvania, and extended from a benchmark east to the Delaware River and west to what was then the boundary with western Virginia. The Maryland–Pennsylvania boundary is an east-west line with an approximate mean latitude of 39°43′20″ N ( Datum WGS 84). In reality, the east-west Mason–Dixon line is not a true line in the geometric sense, but is instead a series of many adjoining line segments, following a path between latitude 39°43′15″ N and 39°43′23″ N.
Mason and Dixon confirmed earlier survey work, which delineated Delaware's southern boundary from the Atlantic Ocean to the "Middle Point" stone (along what is today known as the Transpeninsular Line). They proceeded nearly due north from this to the Pennsylvania border. Later, the line was marked in places by additional benchmarks and survey markers. The lines have been resurveyed several times over the centuries without substantive changes to Mason's and Dixon's work. The stones may be a few, to a few hundred, feet east or west of the point Mason and Dixon thought they were: in any event, the line drawn from stone to stone forms the legal boundary. According to Dave Doyle at the National Geodetic Survey, part of the National Oceanic and Atmospheric Administration, the common corner of Pennsylvania, Maryland, and Delaware, at The Wedge is marked by Boundary Monument #87. The marker "MDP Corner" dates from 1935 and is offset on purpose. 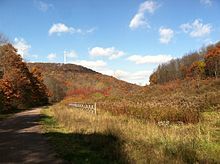 Visitors to the tripoint are strongly encouraged to first obtain permission from the nearest landowner or use the path from the arc corner monument, which is bordered by Delaware parkland most of the way, and Pennsylvania parkland the entire way. 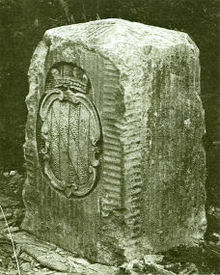 A "crownstone" boundary monument on the Mason–Dixon line. These markers were originally placed at every 5th mile (8.0 km) along the line, ornamented with family coats of arms facing the state that they represented. The coat of arms of Maryland's founding Calvert family is shown. On the other side are the arms of William Penn. The parallel (latitude line) 15 miles (24 km) south of the then southernmost point in Philadelphia, measured to be at about 39°43′ N and agreed upon as the Maryland–Pennsylvania line. The existing east–west transpeninsular line from the Atlantic Ocean to the Chesapeake Bay, as far as its midpoint from the Atlantic. A 12-mile (radius) circle (12 mi (19 km)) around the city of New Castle, Delaware. A "tangent line" connecting the midpoint of the transpeninsular line to the western side of the 12-mile circle. A "north line" along the meridian (line of longitude) from the tangent point to the Maryland Pennsylvania border. "Mason Dixon Line Trail" The Mason Dixon Trail stretches from Pennsylvania to Delaware and is a popular attraction to tourists. The Mason–Dixon line has been resurveyed three times: in 1849, 1900, and in the 1960s. On November 14, 1963, during the bicentennial of the Mason–Dixon line, U.S. President John F. Kennedy opened a newly completed section of Interstate 95 where it crossed the Maryland–Delaware border. It was one of his last public appearances before his assassination in Dallas, Texas. The Delaware Turnpike and the Maryland portion of the new road were later designated as the John F. Kennedy Memorial Highway. In popular usage to people from the Northern United States, the Mason–Dixon line symbolizes a cultural boundary between the North and the South ( Dixie). However, for many people who identify as Southern, Maryland is not considered a Southern state,  leading to confusion over terminology (for more on Maryland's position as southern or northern, see the Region section of the article on Dixie). Originally "Mason and Dixon's Line" referred to the border between Pennsylvania and Maryland. After Pennsylvania abolished slavery, it served as a demarcation line for the legality of slavery. That demarcation did not extend beyond Pennsylvania because Delaware, then a slave state, extended north and east of the boundary. Also lying north and east of the boundary was New Jersey, where slavery was formally abolished in 1846, but former slaves continued to be "apprenticed" to their masters until the passage of the Thirteenth Amendment to the United States Constitution in 1865. Popular culture contains a multitude of references to the Mason–Dixon line as a general geographic division, or character names evoking it, although a minority of those specifically relate to the line itself. The line makes several appearances  in the 1953 Bugs Bunny cartoon " Southern Fried Rabbit". The line separates the drought affected North from which the "Yankee" Bugs leaves in search of carrots in the green lands of the "Dixie" south, the latter being guarded by Yosemite Sam. The 1918 song, " Rock-a-Bye Your Baby with a Dixie Melody", written by Jean Schwartz and popularized by Al Jolson, includes the lyric Just hang my cradle, Mammy mine/ Right on that Mason–Dixon Line. A small group of musicians from Paul Whiteman's orchestra led by C melody saxophonist Frank Trumbauer and including Bix Beiderbecke recorded two sides for Columbia on May 15, 1929 titled, "Alabammy Snow" and "What A Day!" under the pseudonym, "Mason–Dixon Orchestra". It is probable that they chose this pseudonym because the catalog number of the record would be 1861-D, 1861 being the year that the American Civil War began. The Mason–Dixon line provides the main narrative for the song " Sailing to Philadelphia" (featuring James Taylor) by British singer-songwriter and guitarist Mark Knopfler. The 1955 song, " Hey, Porter", by Johnny Cash makes reference to the Mason–Dixon line in the line, How much longer will it be until we cross that Mason-Dixon line? The Shires 2015 song "State Lines" includes the lyrics "Like when you roll your eyes like a cool new Yorker, Driving across the Mason–Dixon line"
The Long Ryders 1985 song "Mason-Dixon line" from their third album "State of our union" refers to the line. Charlie Daniels' 1988 song "Cowboy Hat in Dallas" references the Mason-Dixon line in the verse saying, And there ain't rivers in Mississippi, ain't no Mason-Dixon line. In the regional baseball rivalry between the New York Yankees and the Boston Red Sox, the theoretical border that separates population centers that are majority-Red Sox fans from majority-Yankees fans in Connecticut is sometimes called the "Munson-Nixon Line"   , in a reference to the Mason–Dixon line. Credited to Steve Rushin of Sports Illustrated , the line is named for famed Yankee catcher Thurman Munson and Red Sox right fielder Trot Nixon. Weißwurstäquator, a similar border line in Germany between the Northern and Southern areas of the country. ^ a b c d e Hubbard, Bill, Jr. (2009). American Boundaries: the Nation, the States, the Rectangular Survey. University of Chicago Press. pp. 20–29. ISBN 978-0-226-35591-7. ^ Barton, William (1818). Memoirs of the life of David Rittenhouse, LLD. F.R.S. E. Parker. pp. 282–283. ^ "Slavery in Delaware". Slavery in the North. Retrieved October 6, 2015. ^ Danson, Edwin (2001). Drawing the Line How Mason and Dixon Surveyed the Most Famous Border in America. John Wiley. p. 54. ^ Wilford, John Noble (2001). The Mapmakers: Revised Edition. Random House Digital, Inc. pp. 215–216. ISBN 978-0-375-70850-3. Retrieved November 1, 2012. ^ a b William Ecenbarger, "Neglecting the Mason–Dixon boundary stones", The Washington Post, January 1, 2017, p. C4. ^ Konkle, Burton Alva. (1932). Benjamin Chew 1722–1810: Head of the Pennsylvania judiciary system under colony and commonwealth. Philadelphia: University of Pennsylvania Press. p. 63-4. ^ a b "A Plan of the West Line or Parallel of Latitude". World Digital Library. 1768. Retrieved June 30, 2013. ^ "The men who drew the Mason–Dixon Line". BBC. September 2, 2017. Retrieved September 2, 2017. ^ Linklater, Andro (September 30, 2003). Measuring America. Penguin. p. 33. ISBN 978-0-452-28459-3. ^ Mason, A. Hughlett; Swindler, William F. (February 1964). "Mason & Dixon: their Line and its Legend". American Heritage. 15 (2). Retrieved November 8, 2008. ^ Coast And Geodetic Survey, U.S (1895). "Annual Report of the Director". U.S. Coast and Geodetic Survey: 195. Retrieved December 20, 2012. ^ Danson, Edwin (2001). Drawing the Line: How Mason and Dixon Surveyed the Most Famous Border in America. John Wiley and Sons. pp. 178–79. ISBN 9780471437048. ^ a b Davies, R.D (1985). "A Commemoration of Maskelyne at Schiehallion". Quarterly Journal of the Royal Astronomical Society. 26 (3): 289–294. Bibcode: 1985QJRAS..26..289D. ^ a b Note the comments on Cavendish's speculation in the introductory notes, and the multiple correspondences with Maskelyne in: Mason, Charles; Dixon, Jeremiah. "The Journal of Charles Mason and Jeremiah Dixon 1763–1768" (pdf). Retrieved January 5, 2011. ^ Nevil Maskelyne was elected a Royal Society Fellow on April 27, 1758; see "List of Fellows of the Royal Society 1660–2007" (pdf). K–Z. Royal Society. 2007: 238. Retrieved January 5, 2011. ^ Henry Cavendish was elected a Royal Society Fellow on May 1, 1760; see "List of Fellows of the Royal Society 1660–2007" (pdf). A–J. Royal Society. 2007: 66. Retrieved January 5, 2011. ^ "Specifications and Recommendations for Control Surveys and Survey Markers". Natural Resources Canada. December 27, 2007. p. TABLE E-VI POSITION DIFFERENCES. Retrieved January 6, 2011. Double run in straight line by helicopter between control spaced at 80 km. ^ Taylor, John Robert (1999). An Introduction to Error Analysis: The Study of Uncertainties in Physical Measurements. University Science Books. p. 94, §4.1. ISBN 0-935702-75-X. Retrieved January 5, 2011. ^ Mentzer, Robert. "How Mason and Dixon Ran Their Line" (pdf). Retrieved January 5, 2011. ^ Schaffer, Simon (May 20, 2010). "The Cavendish Family in Science". BBC Radio 4 (Interview). ^ a b Tretkoff, Ernie. "This Month in Physics History June 1798: Cavendish weighs the world". American Physical Society. Retrieved January 3, 2011. ^ Maskelyne, Nevil (January 1, 1775). "An account of observations made on the mountain Schehallien for finding its attraction". Philosophical Transactions of the Royal Society of London. London. 65: 500–542. doi: 10.1098/rstl.1775.0050. Retrieved January 5, 2011. Accordingly Mr. Charles Mason, who had been employed on several astronomical occasions by the Royal Society, was appointed to make a tour through the Highlands of Scotland in the summer of the year 1773, taking notice of the principal hills in England which lay in his route either in his going or in his return. ^ a b Mackenzie, A. Stanley (1900). "Account of Maskelyne's experiments on Schehallien". The Laws of Gravitation: Memoirs by Newton, Bouguer and Cavendish; together with abstracts of other important memoirs. New York: American Book Company. p. 53. Retrieved January 3, 2011. In 1772...The proposal was favourably received by the Society, and Mr. Charles Mason was sent to examine various hills in England and Scotland, and to select the most suitable (32). Mason found the two hills referred to by Maskelyne were not suitable; and fixed upon Schehallien in Perthshire as offering the best situation. ^ John Mackenzie, " A brief history of the Mason–Dixon Line", APEC/CANR, University of Delaware; accessed 2017.01.05. ^ Rasmussen, Frederick (March 28, 2010). "Are we Northern? Southern? Yes". The Baltimore Sun. Retrieved February 23, 2018. ^ "An Act to provide a temporary Government for the Territory of Colorado" ( PDF). Thirty-sixth United States Congress. February 28, 1861. Retrieved February 22, 2007. ^ "Rocky Balboa". The Internet Movie Database. 2006. ^ "Film Review". Empire Magazine. 2007. ^ Dean, Sam. "Attack of the Killer Tomatoes: An Oral History of the 1978 Film". ^ "Fiction Book Review: People's Choice by Jeff Greenfield, Author Putnam Publishing Group $22.95 (309p) ISBN 978-0-399-13812-6". ^ "Book review – Mason & Dixon". The New York Times. 1997. ^ "Mason & Dixon". ThomasPynchon.com. ^ Discography of American Historical Recordings, s.v. "Columbia 1861-D (10-in. double-faced)," accessed August 30, 2017, http://adp.library.ucsb.edu/index.php/object/detail/196765/Columbia_1861-D.
^ a b Giratikanon, Tom; Katz, Josh; Leonhardt, David; Quealy, Kevin (April 24, 2014). "Up Close on Baseball's Borders". The New York Times. ISSN 0362-4331. Retrieved October 25, 2017. ^ RUSHIN, STEVE. "Reconcilable Differences". SI.com. Retrieved October 25, 2017. ^ "Baseball's Borders". The American Spectator. April 25, 2014. Retrieved October 25, 2017. Wikimedia Commons has media related to Mason-Dixon Line. Wikisource has the text of the 1879 American Cyclopædia article Mason and Dixon's Line. "Mason and Dixon's Line" . New International Encyclopedia. 1905. "Mason and Dixon Line" . Encyclopædia Britannica (11th ed.). 1911. "Mason and Dixon's Line" . The New Student's Reference Work . 1914.